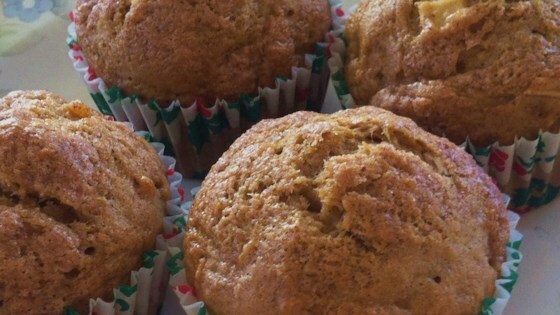 "Similar to pumpkin muffins, these are a great way to use up butternut squash and are not too high in sugar. Even my picky husband enjoys these! Feel free to play around with the spice amounts to your liking." Preheat oven to 400 degrees F (200 degrees C). Grease 20 muffin cups. Cut a 1/2-inch hole into the larger part of the squash and cover with a damp paper towel. Cook squash in a microwave oven in 3-minute increments, turning slightly after each increment, until squash can be easily pierced with a fork, 9 to 12 minutes. Set aside until cool to the touch, about 20 minutes. Halve squash lengthwise and scoop out seeds. Measure 1 1/2 cups squash into a large bowl. Mash eggs, water, vegetable oil, white sugar, and brown sugar into the squash. Whisk whole wheat flour, all-purpose flour, baking powder, baking soda, cinnamon, salt, nutmeg, cloves, and pumpkin pie spice into the squash mixture until you have a smooth batter. Fold raisins and walnuts into the batter. Spoon batter into prepared muffin cups to about 1/2 to 2/3 full. Bake in the preheated oven until a toothpick inserted into the center of a muffin comes out clean, about 15 minutes. Cool in the pans for 10 minutes before removing to cool completely on a wire rack. A super-simple, savory side dish that’s ready in no time. Too moist and very lacking in sweetness and texture. My son (3yr) enjoyed it but he likes bland things. This recipe made 1, 9x5 loaf and 1 mini loaf. Bake mini loaf for 30 min. and big loaf for 50 min. I used apple butter in place of oil and it turned out great! I will make again! I used gluten free flour and buckwheat flour, reduced the sugar to 1/4 cup (to account for the chocolate chips that were added:) and halved the fat and replaced with applesauce.